An adventure/action game released for the Commodore 64, Amstrad CPC and ZX Spectrum in May 1986. The player controls one of a number of teenagers who are stuck in a location and one by one picked off by Jason. The goal of the game is to find Jason and kill him before he kills you. Jason is one of the teenagers disguised, and will after a certain time start randomly attacking the others. The game was played on a wrap-around 4x4 grid of flick-screen rooms, littered with various weapons that the player could use. 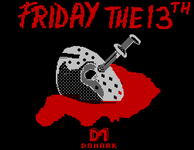 Trivia: The game not only allowed the player to attack the other teenagers (it was the best way to un-disguise Jason), but actually to kill them, so gameplay often evolved into "being the worst" and killing more than Jason did. Killing innocents, however, increased a fright meter and if that reached max, it was game over.